Low key zombie film is going to delight many and annoy others with it's realistic take on a zombie like outbreak. The film plays out in a very realistic way. It begins with a man waking up in the back of deserted ambulance. His eyes are wrapped and he can't really see. Complicating matters is the fact he is handcuffed to a stretcher. He eventually gets free and eventually finds his way to a farm house. At the same time a pregnant police police officer heads off to work. She is unable to reach anyone on her radio. After her own set of adventures she too ends up at the house...they meet and have to stick together to survive. That may not sound like a great deal but it is. The largely realistic turn of events is an unexpected take on the zombie/plague stories that are now almost a dime a dozen. 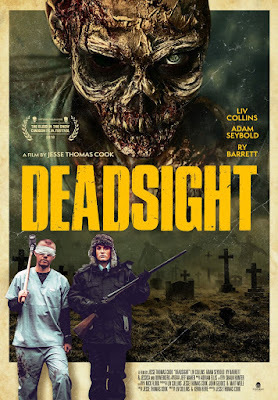 Where normally things would be geared to the next big scare, DEADSIGHT works to how us what a story like this might entail. Journeys are long, compressed by editing. Pacing is deliberately slow to give us time to feel and ponder what it would be like in real life. There is also almost no exposition, things just are. Yes we get some clues late in the game via a found medical chart, and a stray conversation, mostly though the talk is practical. Everything just is and we can read what we want into it. I know not knowing will kill some people,but at the same time it keeps it real since the characters don't really have to explain to each other, they are in the thick of things. Yes there are your typical oozing creatures, but mostly there are the two people at the center. Liv Collins as the cop and Adam Seybold as the blind man give solid performances. They are not super human, they make mistakes, like firing too many bullets. We like them,even if we don't know a great deal about them. You may not think there is a great deal to their performances, but you have to consider that for the most part what they are doing is silent. Seybold and Collins don't meet for probably 30 minutes and something has to compel us to watch how things play out and the performances are a big part of it. The film seems to be full of riffs on other zombie films, like the work of George Romero and TV series like the Walking Dead. Not steals or flashy look at me references, but small passing ones that act as echoes and a short hand of sorts that allow us to more fully understand what is going on and not simply be a list of thigs the filmmakers have seen. I really like DEADSIGHT a great deal. It is a suspenseful, meaty thriller that doesn't throw logic and reason out the window, but keeps it close and uses it to create suspense in ways that most other films in the genre fail to do. Highly recommended for any one who is tired of your typical zombie film and are happy with a tweaking of conventions at a leisurely pace. DEADSIGHT plays Tuesday at the Blood in the Snow Film Festival.